Now, in my little-bitty Southern Baptist church, there was a woman named Mrs. Babcock (not her real name, but close) who epitomized The Church Lady. You remember The Church Lady character from Saturday Night Live? 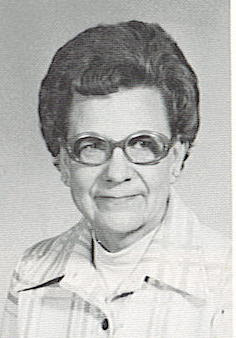 Mrs. Babcock was also the librarian at the local high school in my little-bitty hometown in Texas. Here's a picture of her from my high school yearbook: Pretty scary, isn't it? Now, in my little-bitty hometown Baptist church, there was a women's organization called the Women's Missionary Union (WMU) of which Mrs. Babcock was president. The first Wednesday of each month was always the church supper, followed by the business meeting. Church suppers were great, but business meetings were excruciatingly boring for us kids. Anyway, every month Mrs. Babcock would stand in front of the church during the business meeting and give the report of the WMU. Or as she would say, the "Dubya-Em-Mmmeeewww." As kids, my brother and I would get the uncontrollable giggles every time that poor woman got up to speak. To this day, my brother and I can imitate Mrs. Babcock giving her Dubya-Em-Mmmeeewww report. Now then, in Texas there has been this long-running play called "Greater Tuna" about these characters in the little-bitty, fictional town of Tuna, Texas. What makes Greater Tuna so amazing is that all forty-plus characters are played by only two men. Needless to say, there are lots and lots of quick costume changes. Click here to see the opening scene of Greater Tuna. Now then! Click here to see the character of Vera Carp who, I swear, epitomizes Mrs. Babcock. (My mom and brother will vouch for the authenticity). Can't you just imagine her giving the Dubya-Em-Mmmeeewww report? And if you want to see another great scene, click here to see Bertha Bumiller and Vera Carp at Judge Buckner's funeral. The acting of these two men is simply amazing. These are all characters I grew up with in my little-bitty Southern Baptist church.